Make Calypso part of your weekend for a chance to win a Calypso Party Pack! Using #CalypsoWeekend take a photo of your weekend fun with your favorite Calypso beverage(s). Upload it to Facebook. Your weekend fun can be anything from pool parties, barbeques, tailgate parties, camping trips, picnics, hanging out at the beach, road trips to just having a few friends over. Every Monday starting April 11th until October 3rd one lucky winner will be picked at random to be, Calypso’s “Fan of the Week” and win a Calypso Party Pack! Please note: Only be one (1) Calypso Party Pack will be awarded to the winning photo. Maximum wins is one (1) per Facebook account. * Participation in the Calypso Weekend Promotion constitutes consent for King Juice Company, Inc. / Calypso Lemonades (The Company) to use your name and likeness for editorial, advertising and publicity purposes without additional compensation, except where expressly prohibited by law. This includes using participants’ photos on the The Company’s social media platforms and/or website. The Calypso Weekend Promotion will be advertised or administered through social media platforms, such as Facebook. You understand and acknowledge, however, that the Promotion is in no way sponsored, endorsed, administered by, or associated with any Social Media platform on which it is offered or advertised. You agree to adhere to all rules established by Social Media platforms. Any information you provide for the Promotion is being provided to the Company for its unlimited use. Celebrate Spring with Calypso 10 for $10 at Kroger and other retail stores. Starting March 23rd, 2016 through April 5th, 2016 Calypso will be on sale at the following retail locations; Baker’s, Fry’s, King Soopers, City Market, QFC, Dillons, Pay Less, Scott’s, Smith’s, Gerbes, Owens and Pay Rite Grocery. Stop in today for your Taste of the Islands! LET THE MADNESS BEGIN! #CalypsoMadness starts on our Twitter page Tuesday, March 22nd. Vote each day for the flavor you want to win in our tournament bracket. We’ll be picking our own winners at random from those of you who vote – giving away Calypso Prize Packs, T-shirts and Beach Towels! MADNESS!! Watch the exciting outcome on the live brackets below! 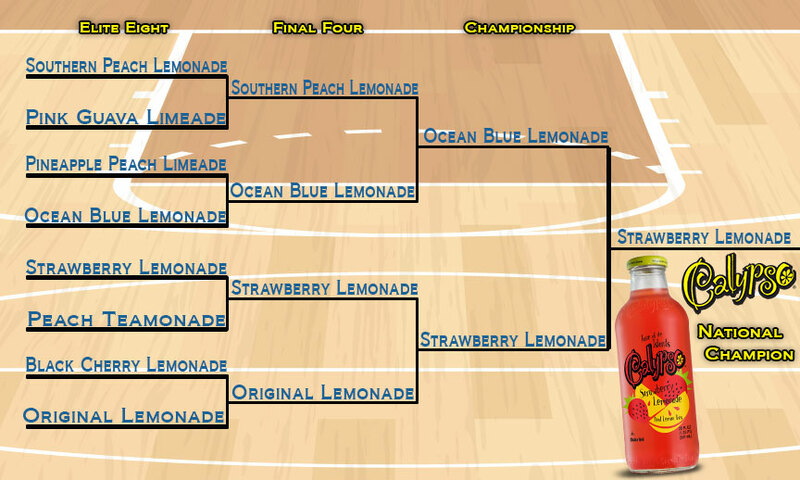 Southern Peach Lemonade is looking to defend its title, but you never know what can happen during CALYPSO MADNESS! Check out last year’s tournament bracket HERE. We are proud to announce that Calypso has broken the Guinness World Record for the Largest Glass of Lemonade ever made! Thank you to all of you who helped us make and drink all that Calypso Original Lemonade, as well as all of you who helped cheer us on from home! Watch the highlights from the Record Breaking Event below!